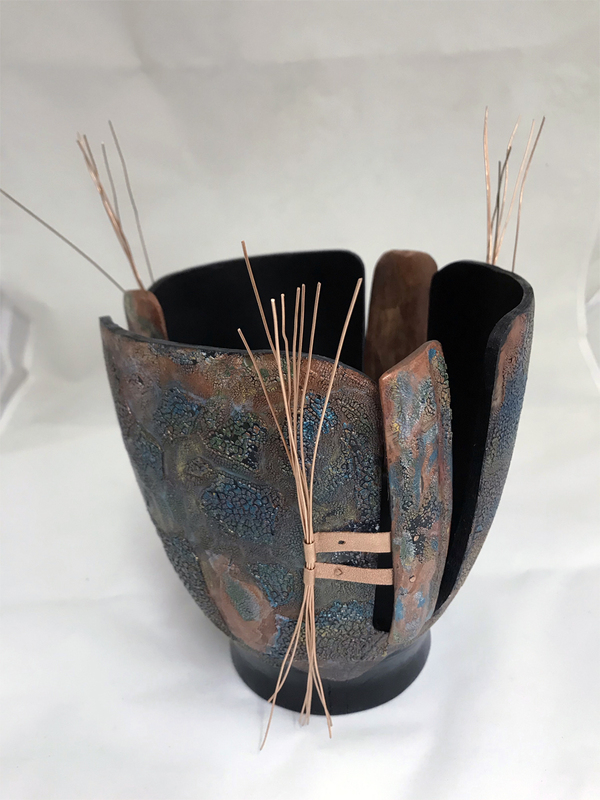 Joanne Sauvageau is from Alberta, Canada where she creates her spectacular art, combining her love of wood turning with other mediums like copper, leather and stone. Joanne credits her Mom for passing on gifts and skills when she was just a little girl, and most of all, taught her to think outside the box. And the members of the World of Woodturners are proud to have Joanne in their midst and to present her as Artist of the Month for April, 2019. The World of Woodturners site (WoW) originated in November, 2001. At its start it was the only interactive site where woodturners could post photos and descriptions of their work and engage in discussion about their art. WoW members think of themselves as a family. They are artists who have become friends and who willingly share their talents and skills. This is a place where the novice freely mixes with the seasoned professional in an atmosphere of shared respect. No one is anonymous and everyone uses their own name. From this venue has arisen some incredible art, some of which can be seen in the public gallery. Enjoy this display of fine work. Access to the site itself is at no cost, by obtaining a membership invitation from an existing WoW family member or contacting site administration at wowadmin@shaw.ca. Include your name and a brief description of your woodturning experience in the message. The site is owned and maintained by the World of Woodturners, Inc., a non-profit organization.